With I2S and TDM digital-audio inputs and feedback-after-filter topology for low noise and high sound quality, these 1×45 W class-D amplifiers simplify design and save BOM costs. Combining these features with full I2C automotive-grade diagnostics including unique offset and open-load detection in play mode, the FDA803D and FDA903D realize the next generation of amplifiers for cost-effective essential safety equipment. Thanks to these integrated features, they simplify certification to the required ISO 26262 ASIL (Automotive Safety Integrity Level), too. 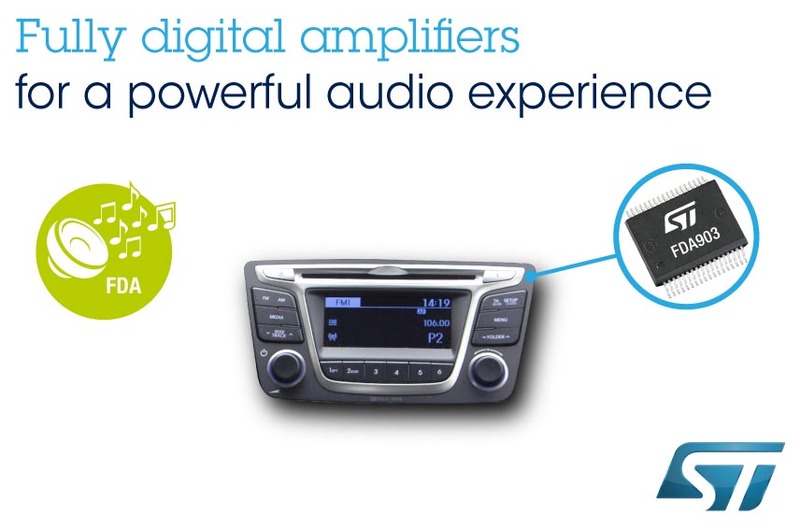 The devices extend ST’s FDA family of robust full-digital audio amplifiers for automotive applications, which includes 2-channel and 4-channel devices up to 4×135 W with features for reliable diagnostics and ST’s innovative feedback-after-filter concept. FDA903D: Efficiency and power dissipation. By delivering high audio quality with low distortion, the FDA803D and FDA903D can be used for adding extra audio channels to high-end infotainment systems, in addition to being incorporated in safety equipment. They can drive down to 2 Ω-load speakers and feature built-in output-power limiting to protect small or low-cost speakers. Efficiency of up to 90% (4 Ω, 1 kHz, 20 W), and high thermal performance from the PowerSSO36 package with exposed underside heat spreader, allow heatsink-free designs that permit smaller modules and simplify mounting in the vehicle. The FDA803D and FDA903D have a wide supply-voltage range of 3.3 V to 18 V, allowing use in a variety of equipment powered from the car battery or other sources. They are tested according to CISPR class V to help ensure compliance with stringent EMC specifications for automotive equipment.